Leonardo DiCaprio’s fourth French Riviera annual fundraising auction will take place on 26th July 2017. The gala is organised by the Leonardo DiCaprio Foundation and has become famous for its opulence and ultra-high-profile guest list. 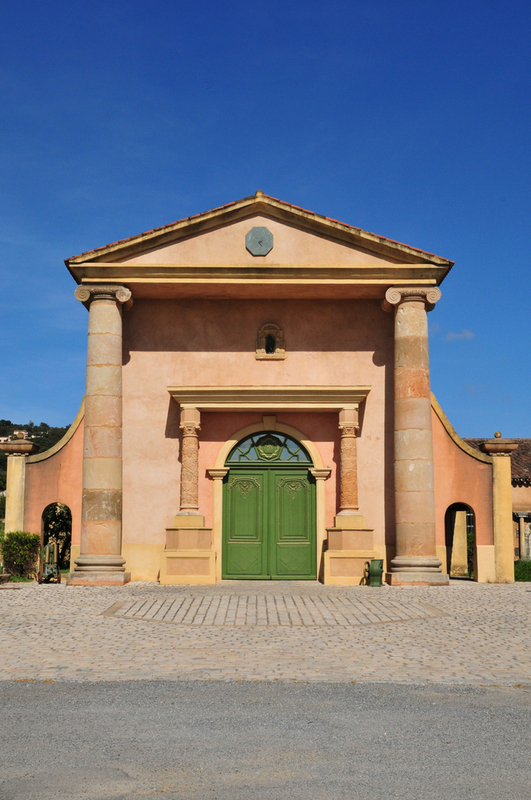 Guests have been sent “save-the-date” e-mails for the environmental organisation’s annual fundraiser at Saint-Tropez’s Domaine Bertaud Belieu vineyard. DiCaprio’s charity is a major player in wildlife and ocean conservation through grants and public education campaigns. The event raises funds to protect Earth’s last wild places, implement solutions that restore balance to threatened ecosystems and ensure the long-term health and well-being of all its inhabitants. Last year, the Oscar-winning actor’s foundation was able to raise $45 million at the Saint-Tropez party. Who Will Attend the DiCaprio Foundation Gala? The Gala is a sophisticated affair with a cocktail reception, live auction and performances. It attracts a diverse crowd of celebrities from different areas of show business; for example, Mariah Carey, Bono and Chris Rock were just three of the stars who attended the 2016 event. Del Rey was the evening’s musical performer along with R&B/Hip-Hop singer The Weeknd and special musical guest Andrea Bocelli. DiCaprio invited plenty of his peers, such as big name Hollywood actors Charlize Theron, Bradley Cooper, Edward Norton, Kevin Spacey, Marion Cotillard, Robert De Niro, Scarlett Johansson and Cate Blanchett who all attended the exclusive evening on the Riviera. Once again, this year’s St Tropez Gala will be co-hosted by the influential actor/environmentalist Leonardo DiCaprio, the foundation’s global chair Milutin Gatsby and chief executive officer Terry Tamminen. The gala will feature a spectacular array of auction items filled with historic celebrity memorabilia, extensive contemporary art and exotic travel experiences. Last year, the auction items included a hugely popular charcoal and acrylic on canvas, titled Tiger on Last Legs by actor and artist Adrien Brody and the chance to be DiCaprio’s personal guest at the men’s final of the US Open. Other auction items included the chance to spend a week on set with Martin Scorsese, a 1950 Jaguar Mark V Drophead signed by Hollywood actors and the cufflinks DiCaprio wore when he received his Oscar. This year, you can expect more of the same once-in-a-lifetime experiences and items available for auction. DiCaprio is an outspoken advocate of environmental conservation, even using his 2016 Best Actor Oscar victory as a chance to express his concern about climate change. 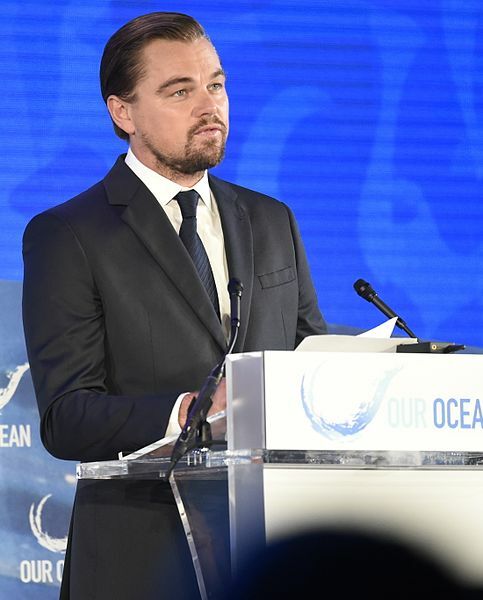 In his Oscar acceptance speech, he said: “It is the most urgent threat facing our entire species, and we need to work collectively together and stop procrastinating.” Attendees of the annual DiCaprio St Tropez gala will hear more of his views spoken with conviction and are sure to donate even more funds to his organisation in 2017. DiCaprio clearly loves the Domaine Bertaud Belieu Vineyard in St Tropez since this the fourth time he’s chosen it as the venue for his Gala. The prestigious wine estate is renowned for its palate-friendly wines beloved by connoisseurs and A-listers alike. Bertaud Belieu vineyard is located in the picturesque village of Gassin and encompasses 65 hectares of vines. The estate dates back to 1340 when it covered more than 600 hectares. Domaine Bertaud Belieu’s refreshing rosé wine is one of the brand’s most popular varieties. 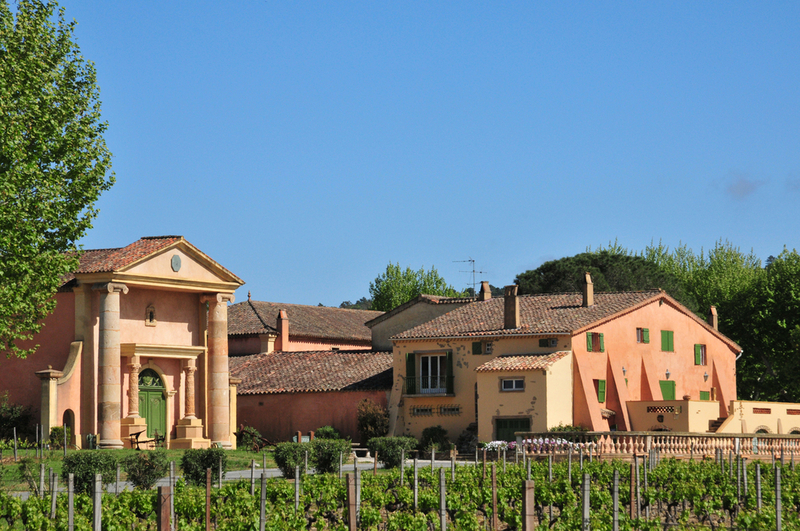 In fact, 80% of its wine is rosé, but the Estate is also known for the quality of its Protected Designation of Origin (PDO) Cotes de Provence red and white wines. Where Can You Stay While Attending the Gala? Fortunately, St Tropez House has several villas located close to the Domaine Bertaud Belieu in Gassin and the surrounding countryside. We’ve picked some of our top St Tropez villa rentals available for the Leonardo DiCaprio Foundation Annual Gala this July. This Provencal style villa is virtually on the doorstep of the Domaine Bertaud Belieu vineyard and is situated within beautiful, manicured gardens that stretch across 6,000 m². The luxurious 420m² property is the epitome of Riviera living with beaches, a golf course and Gassin’s famous Polo Club all located within 10 minutes its grounds. Villa Bastide de Belieu has six beautifully appointed bedrooms including the 50m2 master bedroom and an independent guest house with two ensuite bedrooms. The 60m2 living room is sumptuously decorated in neutral tones with fine cured leather upholstery and the dining room is adjoined by a fully equipped kitchen with access to the wine cellar. There is a summer kitchen and the house is full of technology and entertainment options such as Satellite TV, iPod docking sound system and WiFi to enjoy while relaxing. Of course, some guests want a more active holiday, in which case they’ll enjoy the petanque court, fitness room and swimming pool. Not only is the villa near to Domaine Bertaud Belieu vineyard, but it is also close to three Michelin restaurants in Gassin: Auberge La Verdoyante, Le Pescadou, and Restaurant Le Micocoulier. This refined St Tropez villa rental puts you at the heart of the action and close to the Leonardo DiCaprio Foundation Annual Gala. Villa Ladouceur is another Bastide full of Provencal charm and located among sun-soaked Riviera vineyards. This is an ideal base for a relaxing stay while you’re in town for the Leonardo DiCaprio Foundation Gala. The five-bedroom villa is less than 3 minutes away from the village of Ramatuelle, 5 minutes from the village of Gassin, and less than 10 minutes from the beaches of Pampelonne. The covered terrace is the perfect place to have evening drinks with a large group of friends and it can be accessed from the living room, American Kitchen and dining area. WiFi access is available throughout the property so you can stay connected and check your email before slipping into the swimming pool for a refreshing dip. The villa sleeps 10, but the first floor contains an independent apartment with its own kitchenette, which is perfect for extended families and those who want a little more privacy. Other excellent features include a laundry room, parking space and a garage for bicycles since you’ll probably be tempted to explore the country lanes of St Tropez. Villa Michsino is a spectacular modern villa for rent and it’s ideal for those who want a relaxing experience while remaining close to the action in St Tropez. Villa Michsino is located in the ancient hills of Gassin with panoramic views of the Golfe de St Tropez and the town itself, just a short drive away. The 280m² luxury property to rent in Gassin is just a five-minute drive from the closest beach and the iconic stretch of Pampelonne is 15-20 minutes away by car. The 5-bedroom villa is in immaculate condition and decorated in contemporary style with sumptuous modern furniture throughout. Spread across three floors, the main floor is flooded with light from the enormous bay windows that look onto a family terrace and the villa’s Mediterranean garden. In fact, the bedrooms are equally well appointed with the two large en-suite bedrooms on the top floor boasting unobstructed views down to the coast from their individual balconies. The three double bedrooms on the middle floor each come with an individual shower room and direct access to the swimming pool. 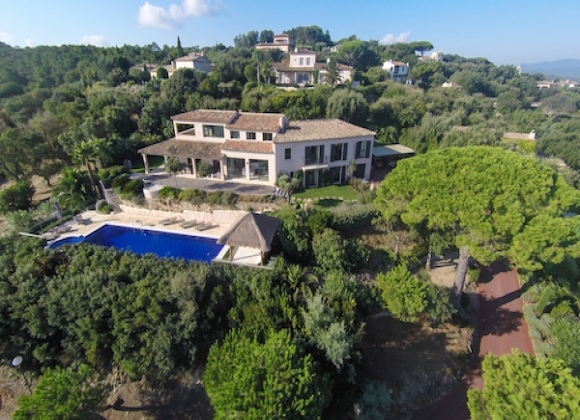 Villa Michsino is also ideally situated for easy access to the world famous beaches of St Tropez. The nearest beach being just a 5-minute drive from the property gate, while the golden sandy stretches of Pampelonne Beach lie 15-20 minutes away by car. Despite its modern exterior, Villa Michsino is situated within a typically Mediterranean garden where guests can relax in blissful seclusion. The amenities include a heated swimming pool, 2-car garage and an alarm system. It’s not possible to feel bored in this area with St Tropez’s nightlife, sports clubs and medieval towns to explore. Best of all, the vineyards of Gassin, including Domaine Bertaud Belieu are all within close proximity to Villa Michsino. 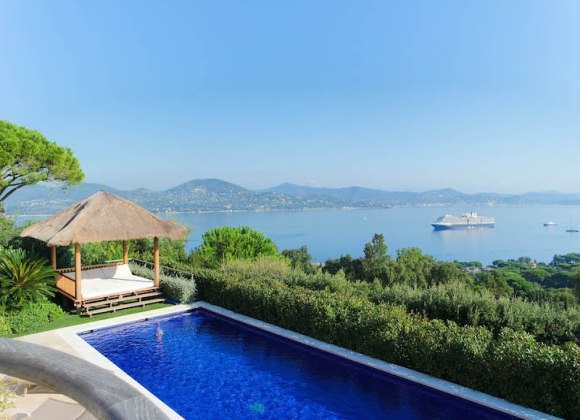 Villa Cerise is not just any St Tropez villa rental; it’s one of our finest. Voted the best sea view villa in the St Tropez House portfolio, the 500m2 villa is a “cherry” on top of the beautiful Sinopolis hills. The 6-bedroom villa is located halfway between the beaches of Pampelonne, Saint-Tropez, the village of Gassin and the village of Ramatuelle. This example of top-end design is idyllically situated in a 2,500 m2 garden with views overlooking the entire Gulf of St Tropez. The property is located at the end of a private cul-de-sac in a classified green zone and it benefits from a state-of-the-art security system. It has a modern interior and exterior which has recently been extended. The large living room overlooks a terrace that faces the azure waters of the Mediterranean and the village of St Tropez. A heated swimming pool and Jacuzzi reside below with similarly captivating views. The decor is modern and inviting, with the light-infused master bedroom having its own private terrace and a bathroom with a dressing room, a bath and a beautiful hammam. Villa Cerise’s other exceptional features include a fully-equipped kitchen, a spacious dining room, storage, a laundry room, wine cellar and garage. Villa Cerise would undoubtedly make a wonderful base for your stay in St Tropez during the Leonardo DiCaprio Foundation Gala and for a longer holiday to make the most of the Riviera during its long summer. You can check out the villa with our drone video here. It’s an outstanding St Tropez villa rental for those who want privacy and luxury while still remaining close to the town. 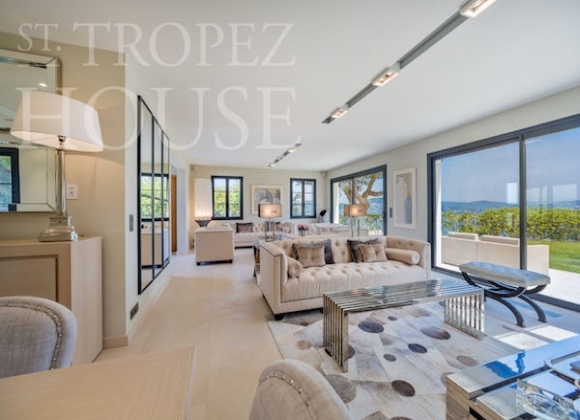 If you are planning to be in town for the Leonardo DiCaprio Foundation Gala and would like to rent a luxury villa in St Tropez, please contact Emilia. Previous postTahiti Beach, St Tropez: A Wonderfully Luxurious Area for Villa Rentals Next postWhat Makes The Best St Tropez Rosé?